As corporate sponsor and long term supporter of the World Cruising Club, organisers of the annual Atlantic Rally for Cruisers, Admiral Yacht Insurance were pleased to be able to participate in the WCC’s Ocean Cruising Seminar recently held in Guildford. Combining classroom lectures with group discussions and one-on-one interaction with speakers and fellow students, this annual seminar provides the perfect opportunity for cruising sailors planning a blue water passage to put a ‘toe in the water’. Taking place over a week-end, the all-inclusive programme of seminar presentations, speaker materials, hotel accommodation, meals and social time provides a fun and informative learning experience for potential offshore voyagers. Robert Holbrook, Admiral’s MD, and Cristelle Paulley, Admiral’s Deputy Underwriter, enjoyed being able to meet and discuss Yacht Insurance with the fifty or so cruising sailors attending the seminar. As a major provider of Bluewater Yacht Insurance cover for over 25 years, and a regular visitor to many of the key locations where cruising sailors congregate around the world, Admiral Yacht Insurance have amassed considerable knowledge and experience of insuring ocean crossings. Our ARC Rally and World ARC Rally Yacht Insurance policies have been specifically developed to meet the needs of sailing rally participants and combine the standard Boat Insurance Cover provided by Admiral’s comprehensive Boat Insurance Policy with benefits not available from other Boat Insurance Companies. 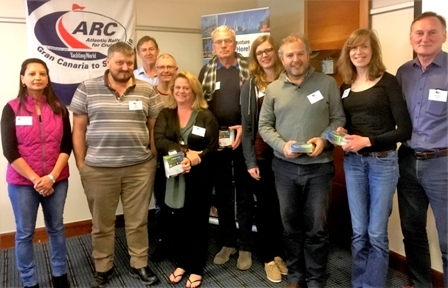 Always keen to promote safety awareness, Admiral Yacht Insurance held a raffle for five boat smoke alarms. The early detection of a Boat Fire using boat smoke alarms is crucial to the safety of all those on board, mitigating a very real risk to both life and the boat. Other World Cruising Club supporters helping seminar participants with their voyage plans included Fischer Panda UK Ltd, Gill, Hamble School of Yachting, Mactra Marine Equipment, MailASail Satellite Communications, Marlec Engineering Co Ltd, Ocean Safety Ltd, Professional Yacht Deliveries, Raymarine, YachtCom and Yachting World.